The Warkworth Music Society is presenting a concert by the New Zealand Guitar Quartet at Ascension Wine Estate, near Warkworth. This world-class quartet was formed in 2010 and comprises Jane Curry (whose CD Morning Dance is highly recommended), Owen Moriarty, Christopher Hill and Tim Watanabe. Anyone with an interest in the guitar, classical music - or great musical performance, regardless of genre - will not want to miss this concert. The quartet's CD The Storm is available from the Quartet's website and an interview with Jane Curry and Owen Moriarty can be heard on Radio New Zealand's Upbeat programme. Tickets will be available at the door for $30 (students free). Info: Ph 09 425 7015. From Warkworth Music Society: The New Zealand Guitar Quartet is quickly developing a following around the country with invitations to perform both locally and overseas. The members have garnered acclaim as soloists on concert stages around the world and in a multitude of international guitar competitions, with each member contributing their individual strengths toward creating an exciting, dynamic and engaging ensemble. 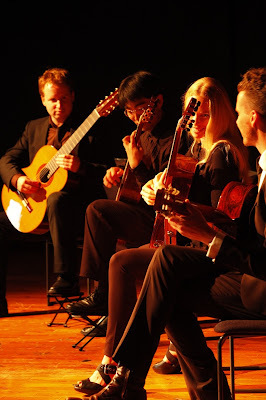 These are programmes showcasing the best and most popular repertoire that the NZGQ have played over the past few years, from arrangements of well-known favourites by Bach and Rimsky-Korsakov, to 20th-century guitar stars Leo Brouwer from Cuba and American composer Ian Krouse. Craig Utting makes an appearance with his Onslow suite, and finally, the chameleon-like quality of the classical guitar comes out in the pieces by prolific Brazilian composer Paulo Bellinati and Afro-Cuban star Carlos Rafael Rivera. A capacity audience of enthusiastic concert goers heard them in Matakana in 2011. Jane completed a Doctorate in Musical Arts (University of Arizona) and is head of the classical guitar department at the New Zealand School of Music. During her time in the US she studied with Scott Tennant, Bill Kanengiser, Prof. Tom Patterson, David Russell, and Sergio and Odair Assad. She has placed in several international guitar competitions, and awarded the International Arts Foundation Scholarship (NZ), Medici Scholar Award (U.S.A), and a Creative NZ Scholarship and Grant to commission composer John Psathas. Completing his Masters in 2003 at Massey University, Owen then headed to USC in Los Angeles. While there here he studied with James Smith, and with LA Guitar Quartet members Scott Tennant and Bill Kanengiser, with subsequent/additional tutelage from Brian Head, Martha Masters, and Pepe Romero. He has done multiple tours both nationally and internationally as a soloist and chamber musician. Studying under Bill Bower, Christopher completed his Honours Degree at Victoria University in 2001. In 2004 he travelled to Spain to study flamenco guitar and while he was there he also gave performances in Italy and Portugal. A member of numerous groups/ensembles, Christopher is a creative composer with a keen interest in new music and (more recently) guitar building. He currently plays as a classical/flamenco guitarist and all-round versatile studio musician.